I first want to point out that out of the 24 cards in the Cartouche, there was not one negative card to fall in this spread. Water —-at Point Two Falls in “Cause of Problem/Reason for asking”. 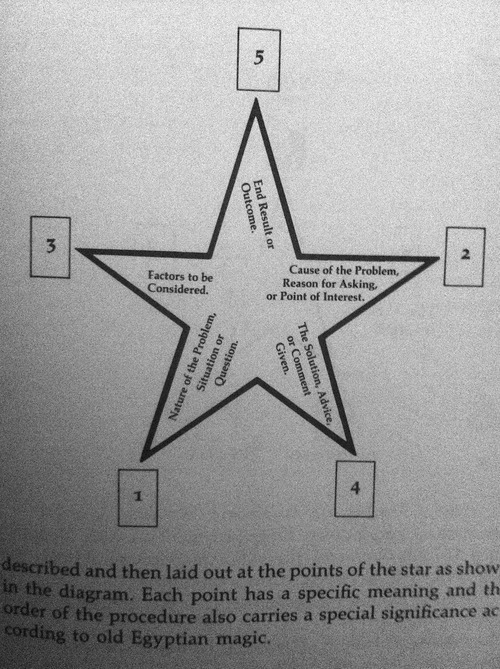 Ankh —-at Point 3 is in the “Factors to be Considered” point. Winged Disk —-at Point 5 falls in the “Outcome/End Result” position. Our Answer for “Will he have peace” is that yes, he definitely will. Below the initial star Spread I pulled two additional cards (with the 5 car star spread, I always pull additional for 10 cards total). Anubis shows Robin’s journey, and appears next to Scarab, which is a transformation of the spirit. Anubis, as known in ancient Egyptian history, is known as the “protector of the dead”, being that “of a jackal-headed god associated with mummification and the afterlife in ancient Egyptian religion.” Anubis is a protector in the Cartouche cards as well, and it shows protection and guidance during travel (spiritual travel in this case) for Robin, and especial Appearing next to Scarab, which in the Cartouche is “Khepera, God of Resurrection and Immortality”, representing change. Is Murray Hope’s Cartouche book Scarab in the spiritual sense says : “the present life of the inquirer is one of spiritual transition, during which the vital step will be (or has already been) made from the pursuit of material experience, to more exalted goals”. The change is beyond the material world at this point. What we know from this spread is that there is a new path and transformation for this person, we think of worldly pains and struggles, and this person is in the process of moving beyond these things, and healing in light«<. 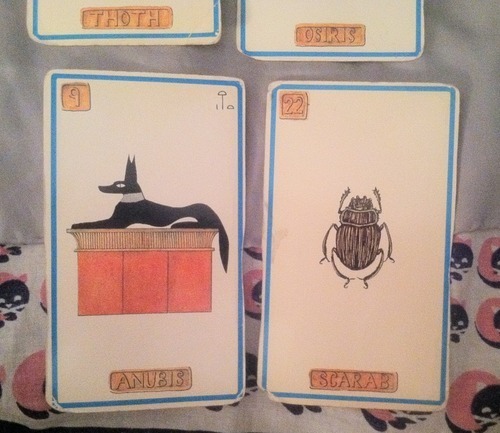 The reading was very special, and the cards that fell are remarkable and worth noting. 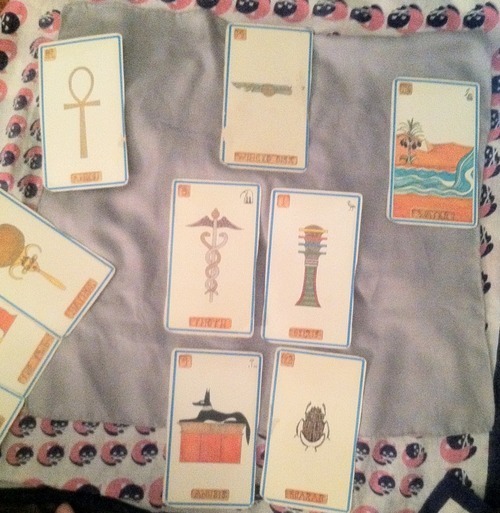 Background energies/last three cards are Horus, Twins, and Hathor. This is family and loved ones of Williams. 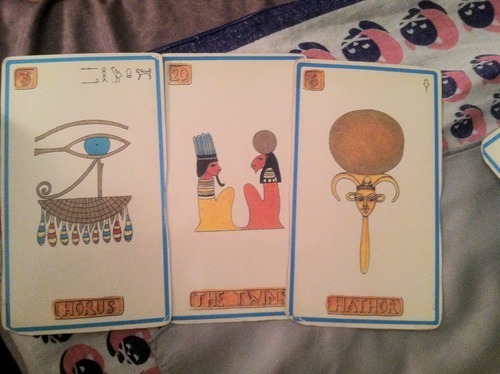 Horus is the “Patron of Homes and Families” in Cartouche, the Twins, even though only two figures are shown in this card, represent many people in different readings, Hathor is a young woman, I feel to represent Robin’s daughter (possibly his wife, but I feel strongly it is his daughter). I believe these cards fell because these are the things that matter to Robin most, they are his loved ones, and people closest to him. This is what he has left behind in the material world.